This past Thursday found me getting a picture taken for my new driver license. I can’t believe we’ve been here over 5 years already! The renewal process is a bit strange in Pennsylvania. One can renew a license at an “Auto Tag” store or online. I chose the online option, only to find out that I still had to go to the Photo Licensing Center to have my picture taken! So much for efficiency! I’m not quite sure what the hype is all about, because i don’t think I’ll be making the trek back there again too soon! The store was nice enough, I guess, but walking in, it was dark. Really dark. With a brown open, exposed ceiling and low lights – and flowers abounding, it was decidedly cave-like walking in. Not unwelcoming, but not welcoming, either. The first area I walked by was the in-store bakery. Some great looking products in cases, a plethora of donuts and bagels, lots of freshly baked breads and bagged rolls, and a stand-alone display of different sandwich rolls. Rolls with no price. I looked and looked, walked up and down, checked some more. No price. No posted price for me means an automatic no purchase. i walked over to the produce section. It was colorful and the produce was nicely displayed. Pricey, too. I had done my major weekly shopping the day before, so really didn’t need any more fresh stuff, anyway. I started walking the aisles. One of my more favorite things to do is walk the aisles of a quiet grocery store. I love walking by products and 1) mocking them for their partially hydrogenated, overly processed, mass-consumerism, or 2) stopping and finding new and unique products hiding amongst the mass-produced junk. What i found strange about this store was how disjointed the aisles were. Walking down an aisle, out of the blue, would be shelves full of items totally unrelated to anything else in the aisle! In my way of thinking, items should at the very least compliment one another in an area. Finding vinegar with the cereal is not my idea of efficient cross-merchandizing! I walked by the deli counter twice, and kept seeing the guy back there – with his plastic gloves on – scratching, fiddling with his hat… My third trip by, I saw a different guy pulling on fresh gloves. I ordered some sliced ham and sliced cheese. He changed his gloves when he finished. I made it over t the meat department and did find a huge box of Italian Sausage on sale, or rather “discounted 50%” with my Clemen’s card. I picked one up. I grabbed a couple more items – some red wine vinegar I keep forgetting to buy, a loaf of Italian Bread (the only one that didn’t have high fructose corn syrup in it!) and made my way up to the cashier – a very helpful older gentleman who ran over to the customer service desk for me to get my discount card application. He was actually the best thing in the store! He explained the card to me, told me about other places it is good, showed me the ‘extra $5.00 off” discounts for spending $40.00. And he thanked me for bagging my own groceries. As I said, it wasn’t a bad experience, but it wasn’t a great one, either. And since the store is definitely out of the way for me, I’d have to make an effort to go there – and it just didn’t seem like it would be worth that effort. Which brings me to dinner tonight! 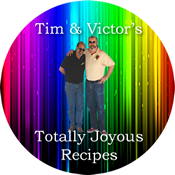 I cooked up a bit of the Italian Sausage – and it was very good! I was feeling a tad lazy today! We had taken the puppy to the dog park, and got home just before the latest torrential downpour hit! (We actually received 2″ of rain in less than an hour!) It was cool in the house, so, looking into the well-stocked ‘fridge and finding most of an onion and most of a bell pepper all nicely wrapped, a pound of mushrooms – and my package of sausage – a bit of a sausage fry was in order! 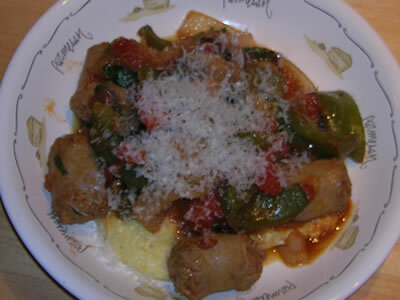 And… with a bag of polenta in the cupboard, a sausage fry over creamy polenta was definitely the ticket! I sliced up 8 chunks of sausage, and sliced the onion and pepper into strips. Threw them into a skillet with a handful of sliced mushrooms, a splash of olive oil and some fresh garlic. When everything was nicely browned, I added a can of diced tomatoes and a bunch of fresh basil from the garden and let it simmer. Meanwhile, I made the polenta. 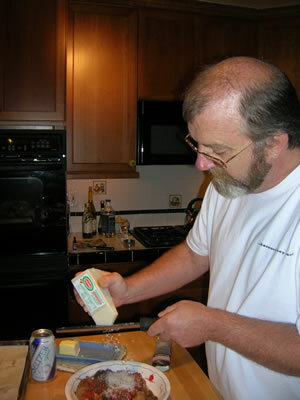 2 cups of milk, a pinch of salt, and 1/2 cup of polenta. i cooked it, stirring now and again, and then added a tbsp of butter and a handful of shredded cheese. Into the bowl it went, with the sausage and peppers on top. A healthy grating of Locatelli on top, and it was a yummy dinner!